Tabla de cifras facilitadas por la OMS y gráfico de la evolución. 2014/08/19. 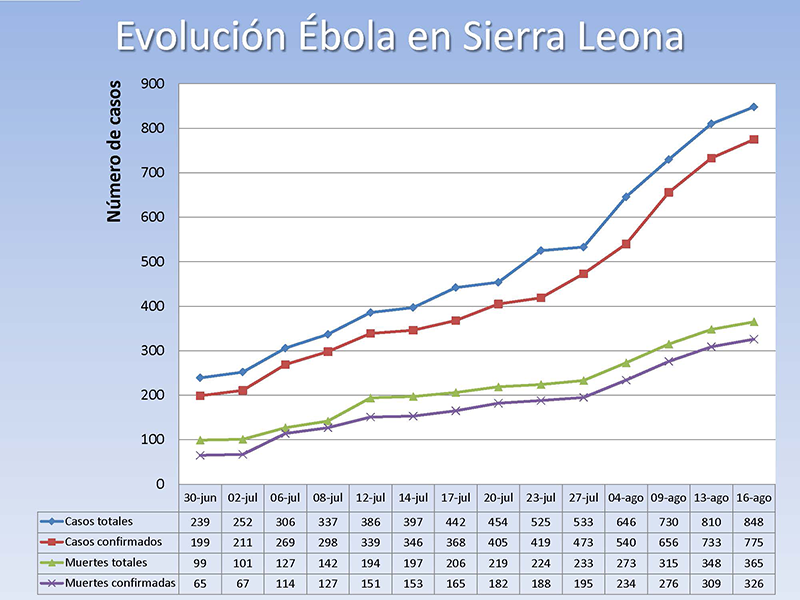 Actualizamos, de nuevo las cifras de la evolución de la epidemia de Ébola en Sierra Leona y Liberia, y reproducimos la carta enviada por el Br. Michael Koroma con las últimas noticias del hospital de Mabesseneh y en la que nos anuncia el cierre temporal del hospital para proceder a su desinfección. También os enlazamos con algunas de las noticias de estos días aparecidas en los medios de comunicación. Carta del Br. Michael Koroma. I would like to continue thanking each one of you for the relentless efforts made so far in helping us combat the deadly disease of Ebola in Sierra Leone and especially its spread amongst staff and patients and the population. So far, we have been doing well and it appears now that the situation in the country is gradually getting under control as a result of the rigid laws and it enforcement mandated by his Excellency the President of the Republic of Sierra Leone. Within our hospital, we are now opting to collaborate in helping the public health team in the chiefdom to improve upon the measures taken to screen the populace and trace contacts. The patients prevailing in the hospital is still low and until yesterday, in agreement with the Local authorities, we ceased operations for a while in order to carry out a through disinfection of the hospital in order to ascertain an Ebola free environment. We shall embark on staff screening daily as well as the patients rigorously. The reasons for this came about as a result of another sudden death of one junior nurse on the 16th August, Micheala Conteh, who fell sick at home on that day suddenly and failed to report to the hospital and delayed until when it was so late, she was brought to the hospital dead on arrival. This nurse has not complained of any illness since she just ended her night duty two days before her sudden death. As a hospital, both staff, Management and the Brothers as well as the District Health Office are wondering what type of sequential death is going on within the hospital. It is on this note that we agreed to cease operations for a short time in order to clean the hospital well and screen every staff working in the hospital and then we resume again. Meanwhile, we continue to care for the few patients admitted in the wards and we shall embark on community sensitization and help the screening of sick persons in the homes so as to track possible suspects’ cases of Ebola in the Lunsar Township. I thank you all and we hope that you will support us at all times during this crisis moment. I will encourage you all to also think of identifying volunteer epidemiologist to come to our hospital for a time during this crisis in order to assist us re-enforce the public health measures and practice of Infection prevention and control measures within the hospital. Noticia esperanzadora desde Liberia: las Hermanas Paciencia y Helena, ingresadas en el Hospital de Elwa de Monrovia, están evolucionado favorablemente y cada día que pasa hay mas esperanza de que puedan superar la infección. Expansión del ébola en África / El País / 15/08/2014. 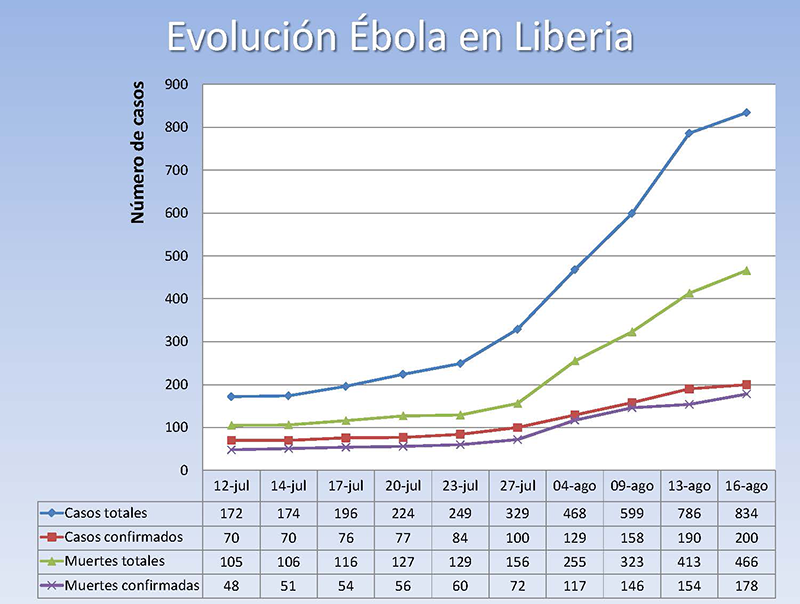 Esta entrada fue publicada en Acontecimientos, Hospital SJG Mabesseneh, Notícias / Actualidad, Sierra Leone, Temas de salud y etiquetada ébola, cifras, epidemia, EVD, hermanos, Liberia, Mabesseneh, Monrovia, noticias, OMS, Saint John of God Catholic Hospital Mabesseneh, salud, St. Joseph's Catholic Hospital Monrovia por comunicaciohsjdbcn. Guarda enlace permanente.